I Want To Book Influencers! You've found influencers that you want to work with. What's next? Get started by creating a campaign. When you find an influencer or group of influencers you'd like to work with, create a campaign to start sending out booking requests. Creating a campaign is a simple 4 step process, and you will be able to navigate back a step to make any changes. 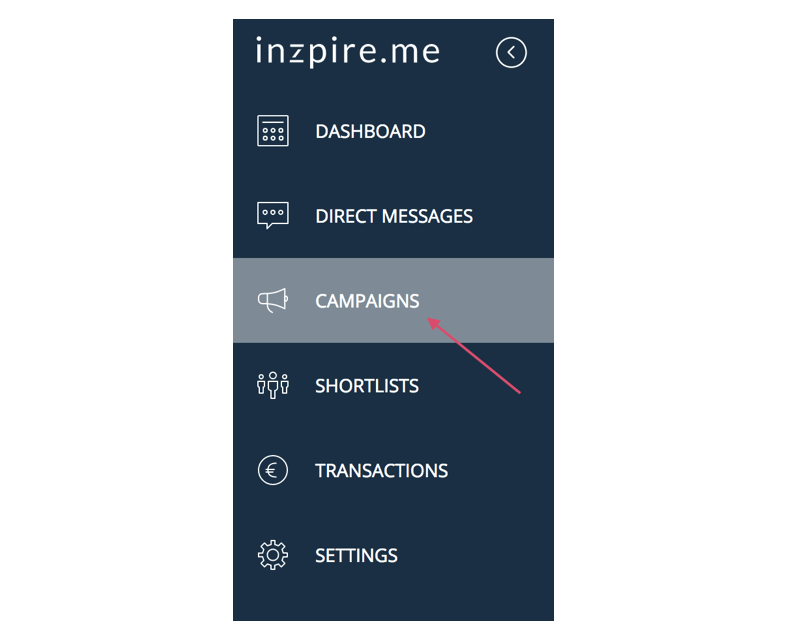 To create a campaign, click on Campaigns in the sidebar menu. Click on Create a Campaign in the top right-hand corner of the page. You will be asked to name your Campaign. After you give it a name, click Next: Create a Brief. You will now be asked to Create a Brief. You will be given the option of writing a customized brief or choosing a brief template you can quickly fill in. If you choose the first two options, the templates, you will be asked to select the appropriate responses to questions concerning your collaboration goals, the social media channels you would like sponsored content to be posted in, delivery dates, and budget. If you choose the third option, the customized brief, you will be asked to write your own brief that includes your collaboration expectations and goals, delivery dates, and budget. Follow these steps if you've elected to use templates. If you choose to write a custom brief, click here for some guidelines and tips on what to include in your Freestyle Brief. Your goals tell influencers what you want to achieve in collaborating with them. You will be asked to select 1 response in 3 categories: Awareness, Consideration, and Conversion. Select a response. If you select Other (specify), a message box will appear and you will be asked to type in your response. Note: the responses may vary between the two templates, depending on whether you chose option 1 or 2, so make sure you have selected the correct template for your collaboration. The first tab is for product features, and the second tab is for app/service features. You will be asked to select the social media channels that you would like the influencers to publish content in. The channels will be pre-selected, and the selections will depend on the channels that the influencers have connected to their profiles. Deselect the channels you don't want content published in. The brief will give the influencer the collaboration details. There will be 10 questions to respond to. Select the date you would like the influencers to publish the post by. If you are sending the influencers a product, take into account the time it takes to deliver the product. If you want the influencers to publish more than 1 post, select the date you would like the last post to be published by. 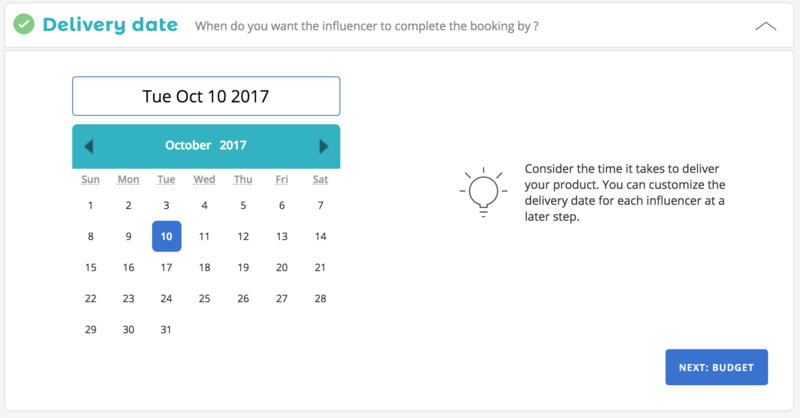 Note: If you want different delivery dates for the influencers, you will be able to customize the dates at a later step. The budget is the average fee the influencers are charging to publish one post. You will be asked to type in the budget you are willing to pay each influencer in the campaign. You are free to offer a lower or higher amount based on the scope of the booking. It is up to the influencers whether they will accept the deviation from average fee. You will be able to customize the average fee of each influencer at a later step. Note: The fee that is displayed will be approximate if your display currency differs from the influencer's selected payment currency. The fee will be in the equivalent amount based on the exchange rate for that day. Our exchange rate is based on data provided by Yahoo Currency Converter. The exchange rate will not be locked in until the influencer accepts the booking request. Also note that depending on your bank/payment method, there may be applicable conversion fees. To learn more about exchange rates and conversions, click here. To learn more about how to change your display currency, click here. 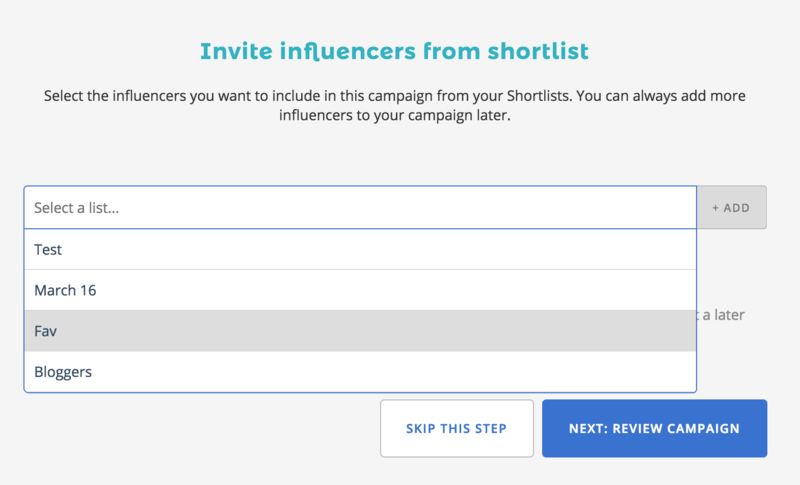 You can invite influencers to your campaign from your Shortlist. If you do not have any Shortlists, click Skip This Step to review your campaign. You will be able to invite influencers to your campaign after you've finished completing your campaign. If you do have Shortlists, select a Shortlist from the search bar and click Add. You can add more than one Shortlist to your campaign. The influencers from the added Shortlist will appear below the search bar. You can expand each influencer for a quick overview of their followers, average fee, etc. 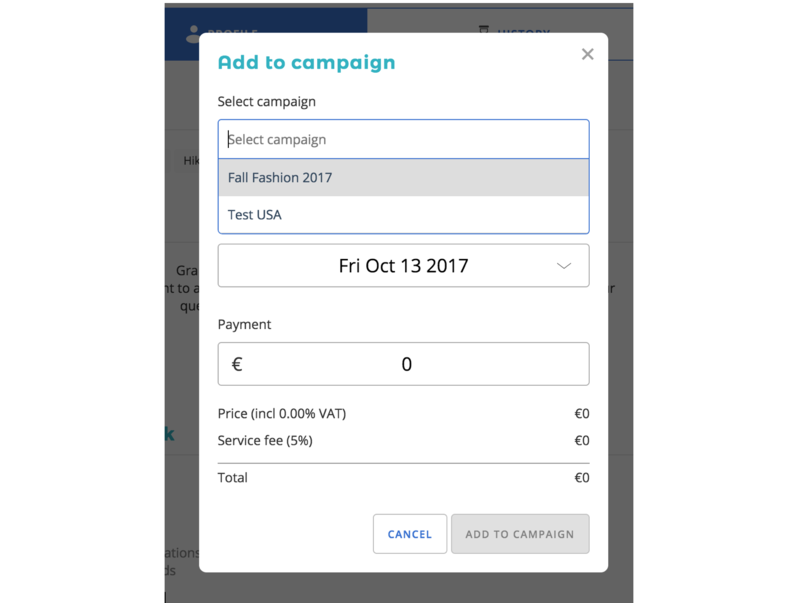 You will also have the option to customize delivery dates and budgets for each influencer by clicking Customize Brief. If you've added influencers to your campaign from a Shortlist, you will be asked to review the content of your booking request. Double check the brief, delivery date, and budget. Before creating your campaign, you will need to add your credit card. Your card will not be charged until the influencers accept the booking request. If everything is in order, select Finish and Create Campaign. The influencers will be notified of your booking request and will have 7 days to accept or decline your booking before it expires. Note: After you've sent out a campaign, you can continue manually inviting influencers to join it. To do this, follow the instructions below. If you did not add influencers from a Shortlist, you will be asked to review the content of your booking request. Click Finish and Create Campaign. This will create an empty campaign. 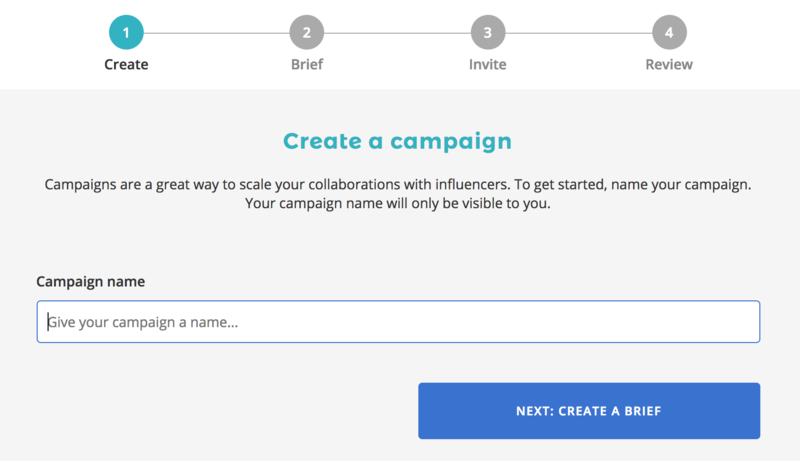 With an empty campaign, you will be able to manually invite influencers to join your campaign. Simply go to an influencer's profile and click Add to Campaign. Select the campaign you'd like to invite the influencer to. You will also have an option to customize the brief, delivery date, and payment. If you have not already added a credit card, you will be asked to add one before the booking request is sent. Once you've reviewed the booking details, click Add to Campaign, and the booking request will be sent to the influencer. Note: Pending booking requests automatically expire after 7 days if the influencer does not respond by accepting or declining your request. Have any questions? Send us a chat!